You’ll either love or hate Bai Dai Beach (pronounced ‘bye-yai’, but also known as Long Beach). Located 20 kilometres south of Nha Trang, Bai Dai is removed from the city hustle and traffic and has a more low-key, backpackery feel. Like Nha Trang Beach, the water is blue and the sand is white. However, Bai Dai is a popular tourist day trip and rather unattractive seafood shacks now line the beach. It’s a great place to dig your feet into the sand as you feast on barbecued clams or fried crab with cold beers, but the beach itself is no longer unspoilt or quiet. You can hire any sort of motorised watercraft, from jet-ski to speedboats, vendors sell cheap plastic floaty toys and rubbish strewn on the beach is an issue. Bai Dai (Long Beach) attracts a mixed crowd. Still, this is the kind of place where you end up hanging out for the whole day, renting beach chairs, reading a book and playing volleyball. Bai Dai attracts a whole mix of people: locals, domestic tourists and foreign travellers. 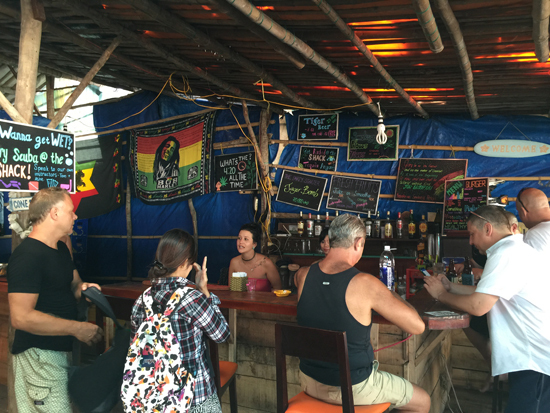 Smack dab in the middle of the action, The Shack and its Bob Marley posters and loud tunes attracts backpackers like flies to honey. It’s the place to be seen, have a burger from the grill and drink fruit shakes or Jager Bombs. On busy days they sometimes have live music. 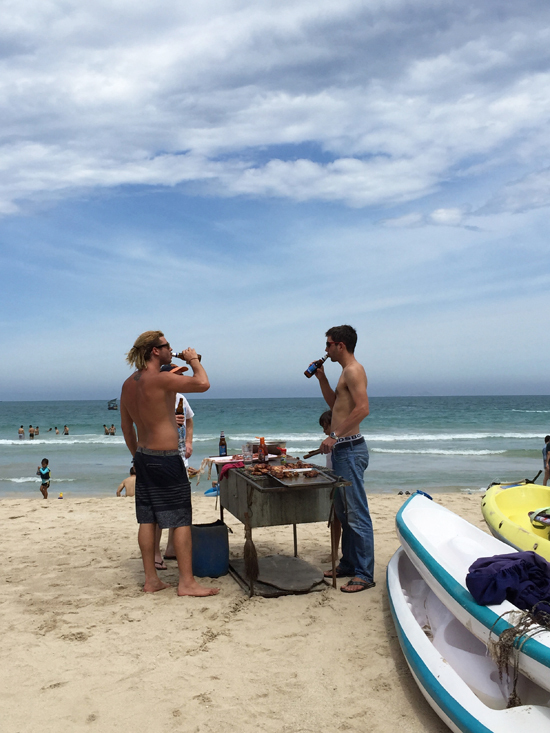 You can also rent boards during the beach’s surf season, from October to April. All the other restaurants serve seafood. Look into the buckets to find what sea beast you want, ask what the price is per kilo and get them to weigh your selection in front of you and note the weight. You can have it steamed or fried, or have a coal brazier brought to the table so you can barbecue it yourself. If you order seafood that you don’t see alive in the bucket, it is probably frozen. Restaurants have rudimentary toilets and shower/change huts for patrons. Feeling crabby? 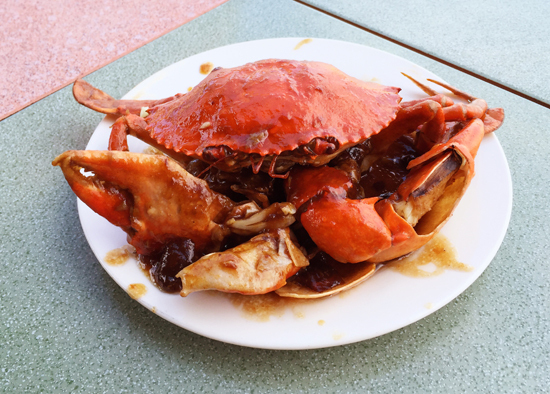 Fresh crab fried in delicious tamarind sauce. Bai Dai isn’t limited to this hub of shacks. It is possible to continue down along the coast and find completely empty stretches of sand and water all to yourself. This area is slated to be the next big thing and development has begun: You’ll see fenced off sand dunes, construction sites and makeshift worker villages. But all beaches are public access (we had many locals confirm this), so it is just a matter of driving along the coast and venturing down the roads that lead to the water. 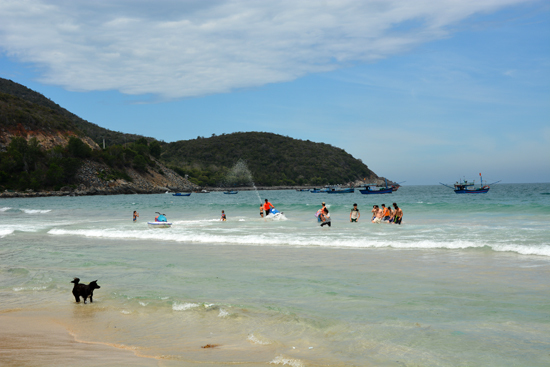 And if you want a clean section of sand, head to the areas in front of a resort (for example, nearby Cam Ranh Riviera). While you wouldn’t be allowed to access the beach through the resort, you can certainly still hang out on their beachfront. To get to Bai Dai from Nha Trang, simply follow the scenic coastal road in the direction of Cam Ranh International Airport. It is four kilometres south of Mia Resort. There’s a big sign at the main entrance. There is no entrance fee to the beach; this is a scam. There is however the usual fee to park your motorbike or car.